This summer, Mary and Jeannie came to visit me and so did my cousins. 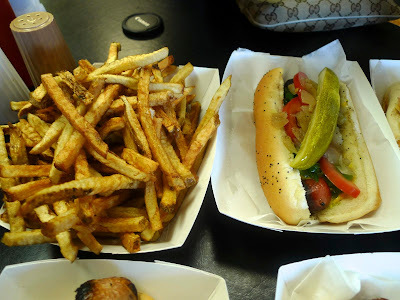 That meant lots of trips to Hot Doug's for me. They are only open from 10:30 to 4 pm on Saturdays so that means you have to go right as it opens if you don't want to spend 2.5+ hours in line. I think we got there around 11 am one time and we ended up waiting exactly 2 hours. We tried the second time to get there right as it opened, and there was still a crazy line. I think it shaved off 30 mins of our wait. Next time I'm getting there at 10 am!! We ordered a bunch of hot dogs to share. I picked the Turducken Sausage with Smokey Bacon Sauce, Pate de Compagne and Brie-Blue Cheese. 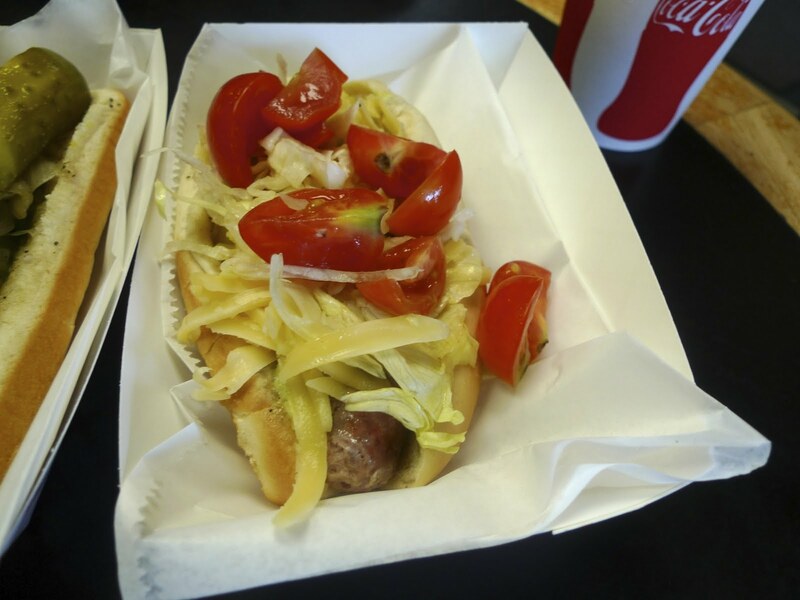 Jeanie picked the Sonoran Dog that consisted of Jalapeno and Cheddar Beef Hot Dog with Jalapeno Mayonnaise, Jalapeno Bacon, Pinto Beans, Tomatoes and Onions. I think she asked for it with just the hot dog and cheese. Here's our order of duck fat fries with a side of cheese. I also got a Chicago style dog so they can have a basis of comparison. Mary got Hot Doug's B.L.T. : Bacon Sausage with Avocado Mayonnaise, Iceberg Lettuce, Cherry Tomatoes and Hickory-Smoked Sweet Swiss Cheese. The next time I came with my cousins. We ordered basically two hot dogs each. hehe. Jung ordered the Foie Gras and Sauternes Duck Sausage with Truffle Aioli, Foie Gras Mousse and Fleur de Sel, which he loved! He got the bratwurst with sauerkraut. 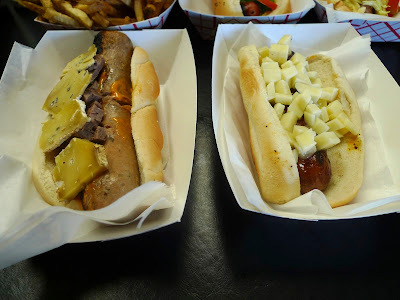 Julie and I got a corn dog, a Chicago style hot dog and two special hot dogs, that I cannot remember for the life of me. They were all delicious. On the way home, we stopped by Bleeding Heart Bakery and picked up a bunch of sweets. My cousins loved the cake balls. If you don't know, Bleeding Heart Bakery just opened up a Humboldt Park location and they are open 24 hours during the weekend. Late night eats here I come!